We moved up from Base Camp (BC) to Advanced Base Camp in a swift two hours and 30 minutes. 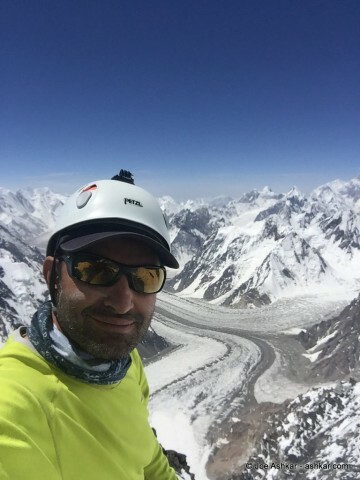 The climb wasn’t easy due to soft and deep snow conditions while carrying over 55 lbs (25 Kg) packs climbing from 5000 to 5300 meters. There were many time where I fell knee or thigh deep in the snow. ABC is in a very tight spot on rocks but well protected from avalanche danger. Cloudy and snowy. We left shortly after breakfast on a acclimatization hike to about halfway to camp 1. Right out of ABC, we climbed up a 45 degrees slope; ice axe in hand and ready to self arrest. About 45 minutes later we reached the top of the fixed lines. We continued climbing up the lines for about an hour and a half before deciding to turn back. The weather quickly changed and it started snowing very heavily. I was feeling lousy from the start and all with back pain. I initially thought it was because of carrying the heavy backpack the day before and sleeping on a deflated mat but all muscles feel very achy with sharp stomach pain. Resting the rest of the day and hopefully feeling better for tomorrow’s big move to camp 1. Today we moved up to camp 1. It was a very tough and steep climb while battling a stomach virus or parasite. Camp 1 is situated in a very tight and limited space and you basically can’t leave your tent. On the way up we saw a few small avalanches and rock fall. I was hit in the left knee by a small rock that made a big bruise. I’m OK though. Tomorrow we move up to camp 2 for 2 nights. Today’s vertical gain was an impressive 1000 meters /3000 feet on the steepest continuous slopes of 45 to almost 60 degrees. Our 3:30 am wake up and subsequent 4:30 am departure to camp 2 was delayed due to very high winds gusting at 80mph/128kmh. We finally departed at 10:30 am even though the winds didn’t slow down much. It was once again a tough tough climb almost all vertical with lots of rock climbing at high altitude. The final obstacle was House’s Chimney which was as tough as advertised. 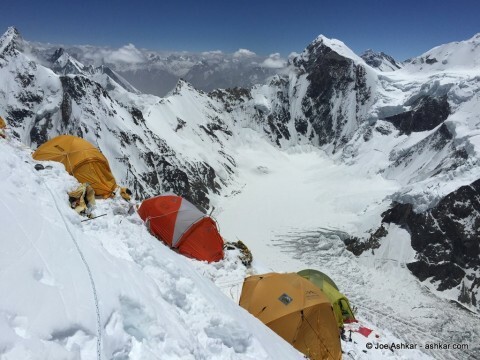 We arrived at Camp 2 at 6700m/22,000ft pretty exhausted. 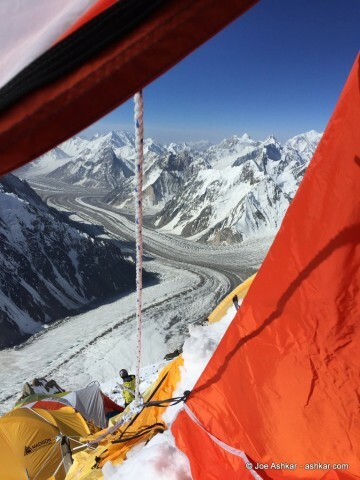 Camp 2 is perched on a ledge with some spectacular view of all three glaciers (Godwin-Austen, Baltoro & Concrodia); we were also treated to clear views of four of the world’s 14 8000 meters peaks (K2, Broad Peak, Gasherbrum I & Gasherbrum II). My stomach bug/parasite is still not gone and was bothering all night. I slept well at Camp 2 in terms of altitude and no headaches and no medications of some sort but stomach cramps bothered me all night. We woke up leisurely when the sun hit our tent between 6 and 7 am and went up the mountain on a acclimatization hike to the base of the black pyramid, the last hurdle before reaching camp 3. We spent the rest of the afternoon resting back at camp 2 and getting ready for tomorrow’s long descent the base camp to end this rotation. 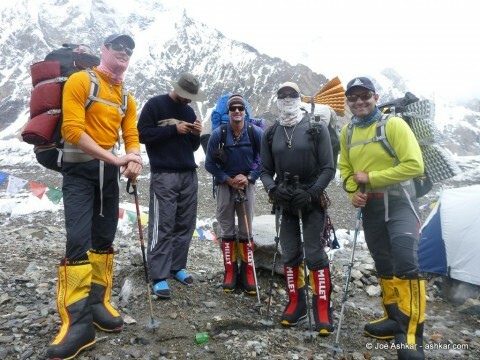 This morning we got up at 5:30AM and got moving on the descent all the way from Camp 2 to Base Camp. 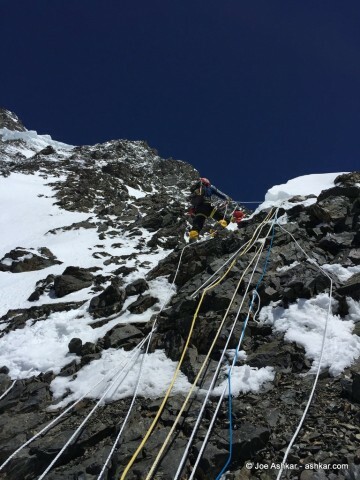 It was a long long way under some tough conditions.The descent from C2 to C1 is riddled with lots of rocks and repelling, especially House’s Chimney with many suspect ropes. From C1 to Advanced Base Camp, the snow conditions were terrible: deep snow, soft snow that looks and feels exactly like granulated sugar; what’s normally an easy quick descent took a long time as we have to carefully move down the fixed lines. Finally, ABC to BC was hot hot hot. The heat was melting a lot of the glacier and many steps were breaking through the soft ice and into water. We finally arrived at Base Camp 6 hours later and very exhausted. Now we get to rest for the next few days and await a good weather window for our Summit attempt.